A common drongo perches in an acacia tree, watching a group of foraging meerkats. The drongo mimics the meerkats’ alarm call, and the little mammals scatter, leaving behind the food they have just found. The drongo swoops down and enjoys another pilfered meal! Common drongos have an unusual hunting technique. What is it? They spit a thick, sticky liquid to trap insects. They attack small frogs and crustaceans with their dagger-like beaks. They mimic the calls of their prey. They mimic the alarm calls of their prey. The alarm call triggers a flight response by the prey, then the drongo swoops in and pilfers the nest or foraged food. Common drongos are solitary nesters. They do not tend to form flocks. The common drongo’s call is a harsh, metallic strink-strink. 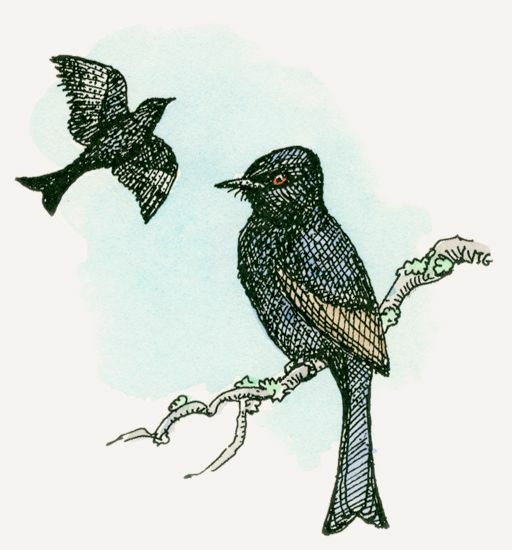 The drongo also produces sounds that mimic the alarm calls of other animals, triggering flight that leaves nests or foraged food exposed for looting. Common drongos are aggressive, protecting their nests with attacks on birds of prey, snakes, and human intruders. They also steal eggs and chicks from the nests of other species. While perched, common drongos, snap up bees, beetles, and wasps. Leaving their perches, they hunt small lizards and fish and steal the eggs and chicks from the nests of other species. Common drongos are monogamous. During the long breeding season, a pair builds a thin-walled, strongly woven, cup-shaped nest in a high tree fork. The female lays two to five eggs, which are incubated by both sexes for about 15 to 18 days. The chicks, fed by both parents, leave the nest after 16 to 22 days. 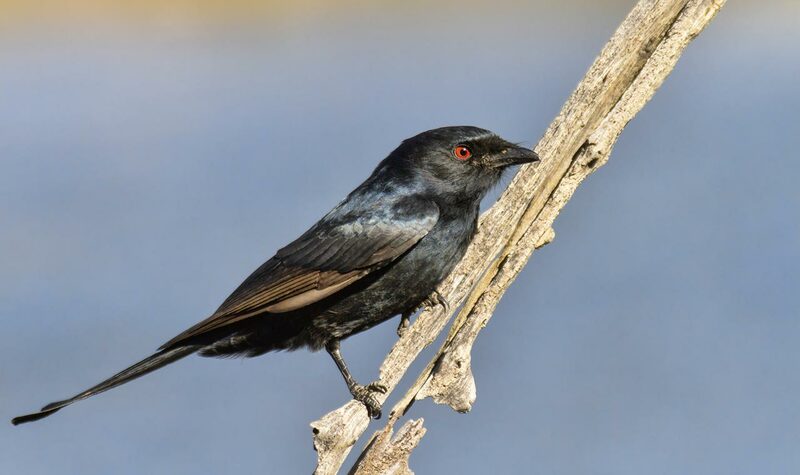 Common drongos are found throughout southern Kenya’s acacia and broad-leafed woodlands. They also live in savannas and in urban gardens. Common drongos, also called fork-tailed drongos, are found throughout sub-Saharan Africa, except in deserts and other treeless regions. These drongos prefer open bush and woodlands. They also live in farmyards, town parks, and gardens. Common drongos often target insects flying around electric lights or those stirred up by the movement of large animals.